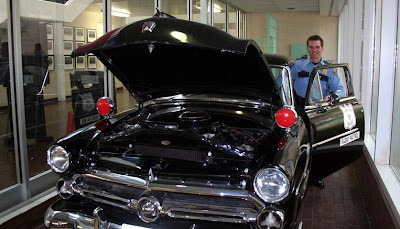 The 1952 HPD patrol car roared back to life on Thursday August 6, 2009 after breaking out of it's glass case in the Police Academy Academic building. The car then parked itself on the front sidewalk of the building and stood by while officers ran for their cameras to get close-up photos. 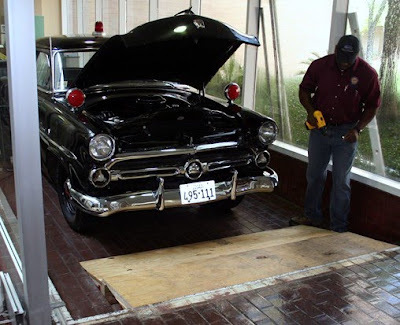 The patrol car had been under glass for about fifteen years. The car agreed to go quietly, only after the good folks at the Planet Ford dealership agreed to give it a new paint job. The car will be proudly displayed in the lobby of Police Headquarters around the first of the year. 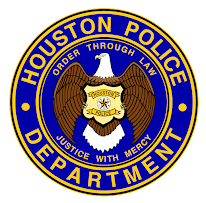 The HPD Museum would like to thank all the people who helped to make the refurbishment and the move possible...Nice Job! Just wanted to let you know how much I enjoy your blog, it puts a smile on my face and makes me proud our daughter is in the academy. We look forward to graduation when she will officially become a part of the HPD family! 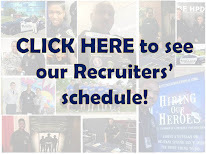 Thank you and thanks to all officers for your service. I am going to miss that old car while it is gone.